Records of a real-life Downton Abbey, a student's complaints of war affecting her studies and an anti-war pamphlet distributed by pram, are just some of the items on display in the University of Southampton's Special Collections Gallery as part of a new exhibition. ‘When the days of conquest are passed: reflections on war and warfare’, runs from October to December and visitors to the University’s Hartley Library will be able to experience letters, photos and other artefacts that shine a light on warfare, and its impact on people’s lives both at home and abroad. Archives of papers belonging to the Duke of Wellington and Earl Mountbatten of Burma - Supreme Allied Commander South East Asia during the Second World War - are displayed alongside a wide range of more personal items, dating from the late-18th to mid-20th Century. A photograph showing injured Belgian soldiers recovering at Allington Manor Sanitorium offers a snapshot into the real-life stories that inspired ITV drama Downton Abbey. 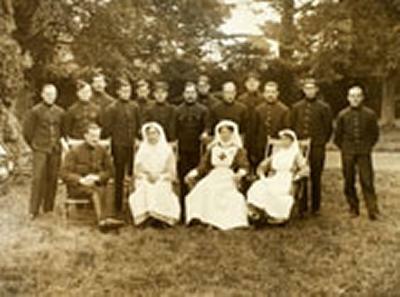 The country house, situated in Eastleigh, was owned by the Swaythling family and used as a hospital during WW1. Lady Swaythling was Chair of the Wounded Allies Relief Committee and helped to raise money by selling cigarettes donated by firms at Caledonian Market in London, evidenced in the collection by a checklist of companies approached for donations. Amongst the various letters on display is a message from a Southampton student in 1939. Nora Harvey writes of how the University was used as a hospital, as well as an army depot, during World War II. She also reveals Southampton’s role as a military camp and port of embarkation for the army. The Tribunal, a leaflet in the collection produced by the No Conscription Fellowship, would have been distributed, in part, by prams. Leaflets opposing the war were heavily scrutinised by the state and so baby carriages were used as a hidden way of spreading the anti-war message. The 50 items making up the exhibition are split into five sections; Patriotism and Duty, From the War Front, Literary Reflections on War, Home Front, and Commemoration and Reflection. The exhibition coincides with Mark Anstee: Enchantment of Distance - a display of artwork by Mark Anstee focusing on war and conflict. ‘When the days of conquest are passed: reflections on war and warfare’ is open weekdays between 10am and 4pm from 13 October to 12 December.